What better way to learn how to beat Rich Franklin in a catchweight bout than to study under a man who has already accomplished the feat? 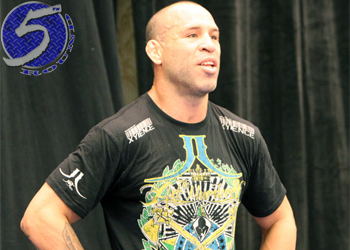 To help prepare for his UFC 147 shootout against Franklin, Wanderlei Silva (Pictured) has recruited former light heavyweight champ Lyoto Machida to fine-tune his skills for the June 23rd scrap. Franklin hung a close unanimous decision win over Silva in June 2009 at UFC 99. In just his third professional outing, Machida posted a TKO victory over Franklin in a 214-pound catchweight contest. The tango took place all the way back in December of 2003, so I’m not quite sure how much “The Dragon” remembers. At the same time, Franklin is a completely different fighter than he was nine years ago. In any case, the footage “The Axe Murderer” has released of his practice session with Machida is pretty interesting. “UFC 147: Silva vs. Franklin II” takes place inside Mineirinho Arena in Belo Horizonte, Minas Gerais, Brazil.